The Miskitos are indigenous people in Central America. Their territory expands from Cape Camarón, Honduras, to Rio Grande, Nicaragua along the Mosquito Coast. There is a native Miskito language, but large groups speak Miskito creole English, Spanish, and other languages. Their creole came about through frequent contact with the British. Traditional Miskito society was highly structured, with a defined political structure. There was a king but he did not have total power. Instead, the power was split between him, a governor, a general, and by the 1750s, an admiral. Although Spanish settlers first began to arrive in Miskito land in the late eighteenth century, the Miskitos continued to dominate the area because of their numbers and the experienced military. Miskito territory is very inaccessible, and was therefore little affected by the Spanish conquest of the area. Their political structure allowed the Miskito people to retain their independence all through Spanish rule and through the Federation of Central American States. However, they were finally absorbed into Nicaragua. There are few (if any) pure-blooded Miskitos alive today, as over the centuries, escaped slaves have sought refuge and intermarried with the Miskitos. Although the Miskito have an indigenous spirituality, today many are Christian. Exposure to international markets has led to a change in hunting methods, and their activities have became market focused instead of subsistence focused. Commercial enterprises were established by foreign companies, and the skills of Miskitos were utilized to facilitate intensive harvesting of green turtles and lobsters. Additionally, climate change is having a devastating effect on the Miskito Indians, especially those dwelling in wooden huts in the western territories. Although the Miskito survived the arrival of European settlers by maintaining their traditional culture and social structures, their future depends on their ability to adapt to changes both social and natural. The Miskito Nation came into being as a state sometime before 1625. Its first recorded king was Oldman, son of an unnamed king of the Miskitos. First contact with the English was made during the reign of King Oldman's father, who sent him to Britain where he received an audience with King Charles I. The Miskito king and the British concluded a formal Treaty of Friendship and Alliance in 1740 followed by the appointment of a resident Superintendent in 1749. A protectorate was established over the Miskito Nation, often called the Mosquito Coast. Traditional Miskito society was highly structured, with a defined political structure. There was a king but he did not have total power. Instead, the power was split between him, a governor, a general, and by the 1750s, an admiral. Historical information on kings is often obscured by the fact that many of the kings were semi-mythical. The Miskito kingdom aided Britain during the American Revolutionary War by attacking Spanish colonies and gained several victories alongside the British. However, at the conclusion of the peace in 1783, Britain had to relinquish control over the coast. The British withdrawal was completed at the end of June 1787. Despite the withdrawal, Britain maintained an unofficial protectorate over the kingdom, often intervening to protect Miskito interests against Spanish encroachments. Spanish settlers first began to arrive in Miskito land in 1787, but the Miskitos continued to dominate the area because of their numbers and the experienced military. Also, the Miskito territory is very inaccessible, and was therefore little affected by the Spanish conquest of the area. Their political structure allowed the Miskito people to retain their independence all through Spanish rule and through the Federation of Central American States. Shipwrecked slave ships in the seventeenth century had left a number of Africans on the coast, who intermarried with the indigenous people producing a mixed race offspring known to the Spanish as Mosquitos Zambos (Miskito Sambu), while the others living more on the southern region (today's Nicaragua) were less mixed and are known as Tawira Miskito by modern scholars. Due to British economic interest in Central America (particularly British Honduras, now called Belize), the Miskitos were able to acquire guns and other modern weapons. After Nicaragua was declared in 1821, combined Miskito-Zambo raiders began to attack Spanish settlements in Honduras, often to rescue enslaved Miskitos before they were shipped to Europe, but often also to enslave other Amerindians to sell to the British to work in Jamaica. They also enslaved women from other tribes. Due to the allowance of polygamy and the added number of women from these slave raids, the Miskito population boomed. These raids continued for many years after any animosity between Britain and Spain ended. The Miskitos, for a long time, considered themselves superior to other tribes of the area, whom they referred to as "wild." European dress and English names were popular among the Miskitos. 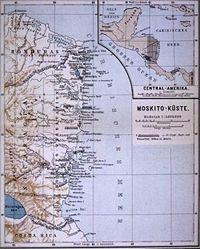 Map of Moravian Missions to the Miskito, 1899. From the middle of the nineteenth century onwards, British interest in the region began to wane. They delegated the area to Honduras in 1859. This caused great dissatisfaction among the Miskito, who shortly afterwards revolted. In 1860, Britain and Nicaragua concluded the Treaty of Managua, which transferred to Nicaragua the suzerainty over the entire Caribbean coast from Cabo Gracias a Dios to Greytown but granted autonomy to the Miskito in the more limited Mosquito Reserve. The treaty was adjudicated in 1881, affirming the Miskito self-government in their territory. However, in 1894 their territory formally became incorporated in that of the republic of Nicaragua by Nicaraguan president José Santos Zelaya. Moravian Church Missionaries had arrived in the Miskito Coast in 1847. Working among the Miskitos and Creoles, they were able to convert many of the inhabitants by the end of the century. The Miskitos who lived in the Jinotega department, west of the Región Autónoma del Atlántico Norte, were much different than the Miskitos who lived along the Caribbean coast. The Miskitos in Jintoega were Catholic and were not influenced by the British, they often traded with the Spanish-speaking mestizos from the Pacific coast. During the conflict in 1927-1933 between Augusto Sandino and the United States over the U.S. occupation of Nicaragua, the Miskitos were asked by both sides to provide food and transport. Many Miskitos in the Jinotega region joined Augusto Sandino and his troops in 1926. As opposed to the Miskitos of the Caribbean coast, the Miskitos of Jinotega had closer ties with Sandino as well as the FSLN, which organized agricultural cooperatives and built schools and health centers in the area. The Miskito continued to enjoy a certain autonomy under Nicaragua, and there was considerable tension between the claims of the government and that of the indigenous people. The presence of the state in the regions where Miskitos lived was reinforced during the 1960s and the 1970s, leading to expropriation of native-held land. During these decades, the Miskitos' only encounter with national politics was to be firmly asked to vote for the National Liberal Party. The fall of Anastasio Somoza led to some improvement of the living conditions of the Miskitos, who looted the possessions of traders who fled to Honduras or to the Jinotega region. The new Sandinista regime established health clinics, schools, and projects supporting agricultural development, while Miskito youths were engaged in the armed forces. Others were given access to education. The creation of Comités de Defensa Sandinista (CDS) also lead to an extension of the state in these regions. The Miskitos, who had been subject to pervasive racism before, were assimilated by the Sandinistas to the exploited classes, granting them a new dignity. Unilateral natural resource exploitation policies which denied Indians access to much of their traditional land base and severely restricted their subsistence activities. Economic embargoes and blockades against native villages not sympathetic to the government. On 25 February 1982, Steadman Fagoth, one of the guerrilla leaders, fled to Honduras along with 3,000 Miskitos, while the Sandinistas began to denounce the incursion of Contras in the Rio Coco zone. The Miskitos occupied the village of San Carlos during the "Red December" (20-21 December 1982) during which several Sandinista soldiers were killed. In retaliation, the state massacred 30 Miskitos in the following days, prompting many of them to escape to Honduras to live in a difficult state of exile. The state of emergency in the Rio Coco zone was proclaimed in 1983, and lasted until 1988. In 1983 the Misurasata movement, led by Brooklyn Rivera, split, with the breakaway Misura group of Stedman Fagoth allying itself more closely with the FDN, one of the first Contra commanded by Enrique Bermúdez. A subsequent autonomy statute in September 1987 largely defused Miskito resistance. Miskito Indians living on the coast of Nicaragua hunted green turtles in the context of a traditional subsistence economy. Turtle fishing was combined with agriculture, hunting, fishing, and gathering. Subsistence activities were timed to harmonize with seasonal fluctuations and resource availability. Turtles were traditionally harpooned. Turtlemen traveled in a small, seagoing canoe, often in hazardous weather conditions, using complex metal maps and systems of navigation to locate the turtles. A hunting party consisted of two men: a "strikerman" in the bow, and the "captain" in the stern. Turtles were intercepted in the area between their sleeping shoals and feeding banks as they surfaced for air. When the turtle had been harpooned, it would pull the canoe along at high speeds in an effort to escape, until it tired and could be pulled alongside the canoe. The export of 'Panulirus argus' or lobsters, is one of the Miskito's main bread winners. These expensive exports have provide jobs and livelihoods for countless Miskito families for generations. From August to May (Lobster season), many of the adult Miskito men dive, and the younger males accompany them in small boats known as cayucos, floating alongside the larger lobster boats. Being promoted from the cayuco to actually diving is considered a rite of passage in the Honduran Miskito culture. … are tall, well made, raw-boned, lusty, strong, and nimble of foot, long-visaged, lank black hair, look stern, hard favoured, and of a dark copper-colour complexion. … They are very ingenious at throwing the lance, fishgig, harpoon, or any manner of dart, being bred to it from their infancy; for the children, imitating their parents, never go abroad without a lance in their hands, which they throw at any object, till use has made them masters of the art. … They have extraordinary good eyes, and will descry a sail at sea farther, and see anything better, than we. The Moskitos are in general very civil and kind to the English, of whom they receive a great deal of respect, both when they are aboard their ships, and also ashore, either in Jamaica, or elsewhere, whither they often come with the seamen. We always humour them, letting them go any whither as they will, and return to their country in any vessel bound that way, if they please. They will have the management of themselves in their striking, and will go in their own little Canoa, which our men could not go in without danger of oversetting: nor will they then let any white man come in their Canoa, but will go a-striking in it just as they please: all which we allow them. For should we cross them, though they should see shoals of fish, or turtle, or the like, they will purposely strike their harpoons and turtle-irons aside, or so glance them as to kill nothing. They have no form of government among them, but acknowledge the King of England for their sovereign. They learn our language, and take the governor of Jamaica to be one of the greatest princes in the world. I could never perceive any religion nor any ceremonies or superstitious observations among them, being ready to imitate us in whatsoever they saw us do at any time. Only they seem to fear the devil, whom they call Wallesaw; and they say he often appears to some among them, whom our men commonly call their priest, when they desire to speak with him on urgent business; but the rest know not anything of him, nor how he appears, otherwise than as these priests tell them. Yet they all say they must not anger him, for then he will beat them, and that sometimes he carries away these their priests. Thus much I have heard from some of them who speak good English. Like many Native American ethnic groups, the Miskitos have a very longstanding oral tradition of passing down stories and their history from generation to generation. One of the most notable tales is of a Miskito man's journey into the afterlife in an attempt to accompany his beloved wife who had died. According to the tale, he insisted on going with her and was able to reach the afterlife. There he experienced an abundance of food, drink, and enjoyment, with no need for work. Finally, however, he grew homesick for his children and returned to the earth, promising not to attempt to reach the afterlife again until his death. Today, the Miskito people stand to lose access to the Pearl Cays, an archipelago of 18 small islets upon which they have relied for centuries, because the ownership of several of the islands is being claimed by a US property developer who is selling or leasing what he asserts as his rights to the public. The Center for Legal Assistance for Indigenous Peoples (CALPI) found that the developer paid $35,000 for the Keys, and is selling them for a total of about $2.5 million. According to CALPI, the American developer did not have title to the land because it is subject to Article 36 of the Nicaraguan constitution. The export of lobsters is one of the Miskito's main sources of revenue, which they continue to catch through diving, despite its dangers. Exposure to international markets led to a change in their traditional hunting methods for green turtles. Hunting activities became market focused instead of subsistence focused. Commercial enterprises were established by foreign companies, and the skills of Miskito turtlemen were utilized to facilitate intensive harvesting of green turtle populations. A series of economic booms and busts led to serious depletion of green turtle populations, and villagers were confronted with rising social tensions and an increased dependence on a scarce resource. In 1998, Hurricane Mitch heavily affected regions where Miskitos live. In September of 2007, Category 5 Hurricane Felix with peak sustained winds of 160 mph struck the coast near Punta Gorda, Nicaragua. Damage and death toll estimates were considerable. Climate change is having a devastating effect on the Miskito Indians, especially those dwelling in wooden huts in the western territories. They subsist on crops planted on a few hectares of land and food hunted from the jungle and rivers, but severe drought is threatening their livelihood as much as the extreme opposite influx of hurricanes. Environmental researchers are warning that the effect of climate change is likely to hit indigenous communities like the Miskito the hardest. Of many native communities, they are likely the least equipped to handle such devastatingly mutable weather conditions, as they are completely powerless and vulnerable to these highly unstable weather patterns. Their very survival could depend on their ability to adapt to climate changes, which have altered the way they have farmed for centuries. 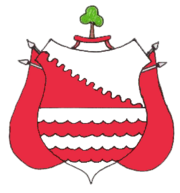 In April, 2009 the Miskito announced a unilateral declaration of independence from Nicaragua under the name Community Nation of Moskitia. They designed a flag and composed a national anthem. However, this declaration has not been met with any formal response from the government of Nicaragua nor has it been recognized by any other state. ↑ Karl Offen, "The Sambu and Tawira Miskito: Origins and Geography of Intra-Miskitu Differentiation in Eastern Nicaragua and Honduras," Ethnohistory 49(2) (2002): 319-72. ↑ Reports of International Arbitral Awards, Award as to the interpretation of the Treaty of Managua between the United Kingdom and Nicaragua Vol. XXVIII (July 2 1881):167-184. Retrieved August 9, 2011. ↑ Jinotega's Miskitos and Sumus: Little Noted Victims of the Contra War. Central American University - UCA Revista Envío Number 95 , Junio 1989. Retrieved August 17, 2011. ↑ Gilles Bataillon, On line Cambios culturales y sociopolíticos en las comunidades Mayangnas y Miskitos del río Bocay y del alto río Coco, Nicaragua (1979-2000), Journal de la Société des Américanistes, 2001, tome 87, (Spanish) Retrieved November 24, 2007. ↑ Il y a Miskitos et Miskitos, in L'Humanité, 27 February 1992 (French) Retrieved November 24, 2007. ↑ Observations finales du Comité pour l'élimination de la discrimination raciale : Nicaragua. 22/09/95., UNHCR, 1995 Retrieved November 24, 2007. ↑ 8.0 8.1 8.2 8.3 William Dampier, A New Voyage Round the World 1927 Argonaut Press reprint edition, adapted. Retrieved December 11, 2007. ↑ Journey to the Afterlife Native Languages of the Americas. Retrieved December 11, 2007. ↑ Susan C. Stonich, Endangered Peoples of Latin America: Struggles to survive and thrive. (Greenwood Press, 2001, ISBN 031330856X), 91-94. ↑ Alice Cherbonnier, A Struggle that will Never End Nicaraguan Lawyer Fights for Rights of Indigenous Peoples. The Baltimore Chronicle. December 17, 2002. Retrieved November 24, 2007. ↑ Giovanna Tassi, Honduras: Death Looms Over Miskito Lobster Divers Inter Press Service News Agency. Retrieved November 24, 2007. ↑ Felix's dead wash ashore Toronto Star. September 7, 2007. Retrieved August 17, 2011. ↑ Annie Kelly, Hope dries up for Nicaragua's Miskito The Guardian May 29, 2007. Retrieved November 24, 2007. ↑ Stephen Gibbs, Nicaragua's Miskitos seek independence BBC News, August 3, 2009. Retrieved August 30, 2011. On 13, Sandinistas vs. Miskitos New York Times July 29, 1986 review of Lee Shapiro's documentary movie Nicaragua Was Our Home. This page was last modified on 10 October 2018, at 15:02.